← Correct Microchip Scanning Procedures Saves Lives! Many animal shelters in America have contracts with local municipalities to hold “stray” dogs for the state-mandated stray hold to give owners an opportunity to reclaim their lost dog. This period of time varies from state to state. When a person who has lost a dog comes in or calls to file a report. When “stray” dogs are picked up and impounded at the facility. Today we want to talk about using Facebook to maximum potential to help lost dogs get home. We are thrilled to see so many shelters and animal control facilities (big and small) using Facebook to try to reunite lost dogs with their owners. We have been in the Facebook game since our inception in early 2010 and we’ve seen a lot of changes along the way. We have gained a large following (50,000+ Facebook fans) and have learned many lessons from our successes and failures. We have seen what does and doesn’t work. We have also seen some shelters start to post impounded found dogs on Facebook and then stop, claiming that it isn’t working or that it requires too much time. We would respectfully like to offer some suggestions that may help make everyone happy: shelter management, the taxpayer, the shelter donor and volunteer, the dog’s owner and of course the dog that gets to go back home! You will decrease the length of stay for animals in your shelter. You will free up space for needier animals. You will increase your shelter’s reputation and goodwill (and possibly generate donations from grateful owners and fans). Nothing tugs at heartstrings better than happy reunion photos when an owner reclaims their dog. Make sure you have a camera handy! You will become a resource in the community for owners who are missing their dogs. Post articles and tips to help people find their missing dogs. Also post happy reunion stories, microchip clinics in the area, and lost pet flyers for members of your community who are missing their pet. You will help your community make a “paradigm shift” that not all stray dogs are homeless. If your “stray” intake is low use your main Facebook page to post them. The beauty of posting lost and found dogs on Facebook is that a neighbor or complete stranger might “happen chance” to see the post of the found dog and know where he/she belongs. Or, they might see the lost dog and then see the post. Yes, the people that are actively matching (the owner, our volunteers and members of the public who enjoy doing this) will seek out the info where ever it is stored, whether it be on a website or a separate Facebook page but that only takes care of the actual matches (where a lost report matches a found report) which is still a fairly small percentage of the reunions. The best chance for a “happen chance” reunion is to get the posting in front of the biggest audience possible, which is almost always your main Facebook page that you use for all of your shelter Facebook posts. Pictures of impounded pets are one of the most widely shared posts on Facebook (much more than adoptable pets) so posting them on your main Facebook page has the added benefit of driving traffic to your page so that your adoptables, fundraisers, etc. are also more likely to be seen. A common mistake we see is shelters that try to run a separate Facebook page for found pets and then not actively working to build the fan base of that page. The average person is not going to stumble across the Found or Stray page by accident and Facebook does not make it easy to search. So you will only reach those that are actively looking for your page and the likelihood of “happen chance” reunions will be greatly diminished. If your shelter has such a high intake of “strays” that posting them on your main page is not feasible, then yes, perhaps setting up a separate Facebook page is the best solution. Make sure that you include your location name and county in the title of the Facebook page. Make it as easy as possible for people to find it. Include it on your website and in any literature you distribute. Include links to the Stray page in the “About Us” section of your main Facebook page. Drive traffic to the Stray page at least once per day (more at the beginning) by sharing a post from it onto your main page and reminding your fans that “All impounded pets at xxxx shelter can be seen by visiting our Stray page”. Use hotlinks and Facebook tags whenever possible so that people can just click and be taken directly to the new page. Ask one or two volunteers to help you with this page and give them full access to it. They should engage with the fans and commentors. It’s called “social” media for a reason! Make sure they answer every question and respond to comments. Get your community actively engaged in helping reunite found pets! Volunteer Facebook administrators can also share the posts on other neighborhood pages – including police departments, newspapers, radio stations, vet clinics, dog parks, town pages, garage sale pages, buy/sell pages and popular neighborhood hangouts like bars and restaurants. This can quickly increase the fan base of your page and makes an excellent and rewarding volunteer opportunity for someone who cannot make it into the shelter to do hands-on work. 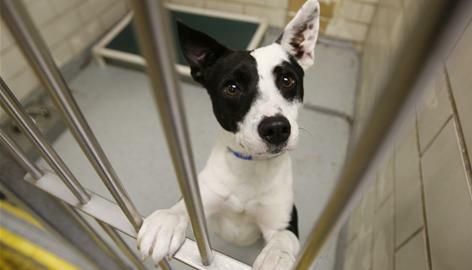 Do not get discouraged if the public offers to adopt the dog rather than trying to find the owner. Create some standard responses that your volunteers can copy and paste below these comments. And remember! You are lining up potential adopters if an owner does not come forward. Link your “Stray” page to a Twitter account with a free Facebook app that will automatically retweet everything you post. Once it is set up it is seamless and maintenance free. You will reach a much broader audience especially if you use hashtags in front of the location. Many police departments and media outlets monitor twitter via hashtag and will retweet your posts for lost and found dogs. This entry was posted in Rescues and Shelters and tagged Facebook, Lost Dogs of Wisconsin, Photographs, Return to Owner, Social Media Twitter, Stray pages, Strays. Bookmark the permalink.